While health-conscious women have known about calcium’s role in protecting bone health for decades, the relatively recent focus on vitamin D may catch some older women off guard. The current recomended daily dose of 600 international units of vitamin D for females ages 18 to 70 plus triples the previous recommendation of 200 international units. Vitamin D helps your body absorb calcium. In turn, calcium helps lower your risk of osteoporosis by promoting bone health, according to the National Institute of Health’s Osteoporosis and Related Bone Diseases program. Working together, the two nutrients also promote proper function of your heart, muscles and nerves. People with low levels of vitamin D have a higher risk for heart disease, diabetes, hypertension and some forms of cancer, according to the University of Maryland Medical Center. The current recommendation of 600 international units for daily vitamin D intake applies to men and women over 40 years old, pregnant or lactating women through age 50. In fact, the suggested amount of 600 international units applies to all males and females between 1 and 70. The suggested amount does not rise to 800 international units for both women and men until age 71. Always ask your doctor for the latest research and recommendations. The current recommendations reflect the 2010 decision by the Institute of Medicine’s Food and Nutrition Board to increase the recommended intake of vitamin D for all age groups. According to the Linus Pauling Institute, however, some health advocates believe adults need a higher daily amount of the nutrient for optimal bone health. A 2006 report published in the American Journal of Clinical Nutrition, for example, posits that all adults need at least 1,000 IUs of vitamin D each day. 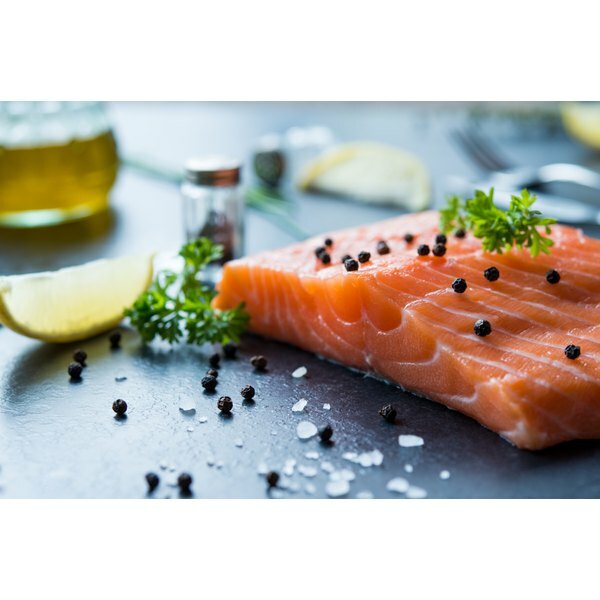 A serving of pink salmon provides almost 90 percent of your daily value of vitamin D, according to the Linus Pauling Institute. Sardines and mackerel have almost 40 percent of your daily value for the nutrient. Fortified juice, milk and breakfasts cereals also provide excellent sources of vitamin D, contributing an average of 15 percent of the daily value of vitamin D.. The U.S. Department of Agriculture’s database for vitamin D reveals that creamy soups and puddings, pork and other kinds of fish all contribute at least 10 percent of your daily recommended allowance for vitamin D. Eggs and some beef varieties also contain high levels of the nutrient. Along with food sources, people may obtain vitamin D from sunlight or from supplements. Exposing skin to sunlight enables your body to produce vitamin D. For that reason, if you spend most of your time indoors, or wear sunscreen and protective clothing while outside, you may not get much vitamin D benefit. Because doctors recommend protective measures to avoid skin cancer, limiting your exposure to sun may not fulfill your need for vitamin D. You may choose to take a supplement to offset what you do not obtain from the sun or from your regular diet. The two forms of vitamin D available as supplements include vitamin D2 and vitamin D3, or cholecalciferol. According to the University of Maryland Medical Center, vitamin D3 supplements may boost your levels of the nutrient more efficiently, but ask your physician before changing your vitamin regimen. Does Orange Juice Give You Folic Acid?